Home » Blog » Is Hammered Style Is Perfect for Personalized Jewelry? Hammered-style personalize jewelry hammered style personalized jewelry is trending in the fashion jewelry world. Hammered jewelry is made from hammered metals, regardless of material, gold, silver, and rose gold. Hammered styles are the textured adding interest to your casual everyday looks and to an evening out. So let’s see if is hammered style is perfect for personalized jewelry? What Is Origin of Hammered Style Jewelry? Ancient civilizations such as the Aztecs and the greeks were among the first who were documented using hammering designs into jewelry, the items were cuffs and necklaces. It is assumed that in ancient times hammered style jewelry was used by royalty. In modern times hammered style jewelry was seen in the 30s, and again in the 90s. Hammered jewelry was almost unseen when the bling was into fashion in the last two decades. In 2018 the trend started to rising again as younger fashionable people are looking for disruptive jewelry design to present their personality. A significant drive was online shopping and Etsy at particular giving personalized jewelry designer an opportunity to sell their designs to the world. Hammered jewelry are manufactured pretty much is it sounds. With a hammer, different hammers create different facets and textures on different metals. Why Do You Think Hammered Style Is so Perfect for Personalized Jewelry? The Answer Is Straightforward: No Two Pieces Are the Same, like You and Me! As shown in the video, the hammering process creates a unique nonreproducible pattern for each piece of jewelry. 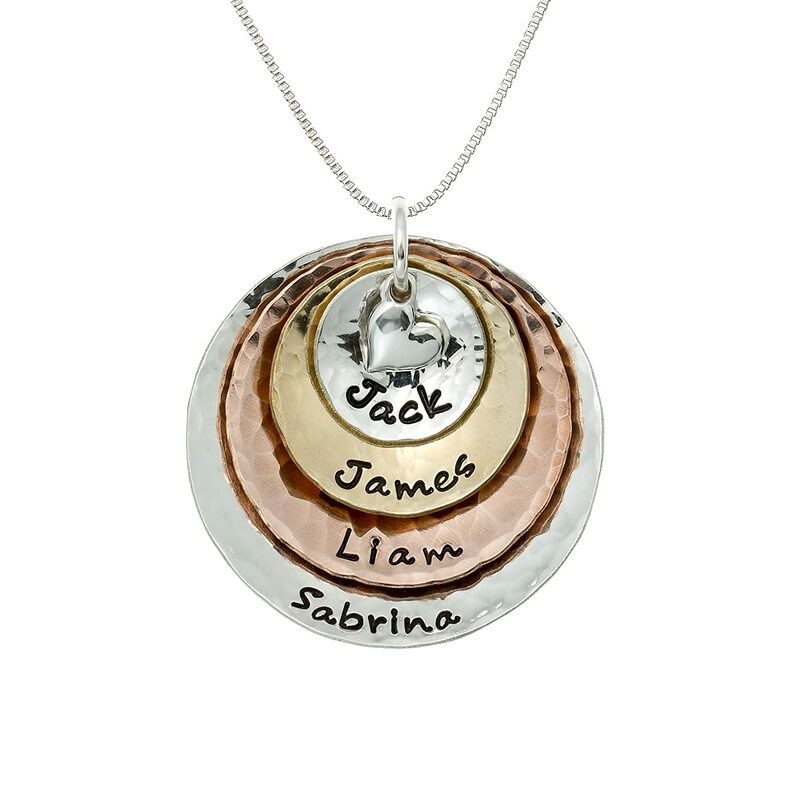 hammered jewelry is personalized, not only a name necklace. Do Want to See Where to Get Personalized Hammered Jewelry? Nice Brand to Guarantee Authenticity of Materials. The first is Isabelle Grace Jewelry, a boutique jeweler from New Bedford, Massachusetts. Isabelle grace slogan in personalized jewelry for the modern living captures the spirit and vibe of hammered style jewelry. Isabelle Grace Jewelry specializes in hammered personalized necklaces, charms, initials jewelry, and semiprecious stones to create a fine piece that tells your story through the jewelry. If you want a customs design from Isabelle Grace Jewelry piece, the average production time for custom orders is 10 days, so you’ll have to be patient but it is definitely worth it. A recent review: “Beautiful Piece This gorgeous necklace was designed with my baby’s name on it as an early Anniversary gift…I LOVE IT!!! 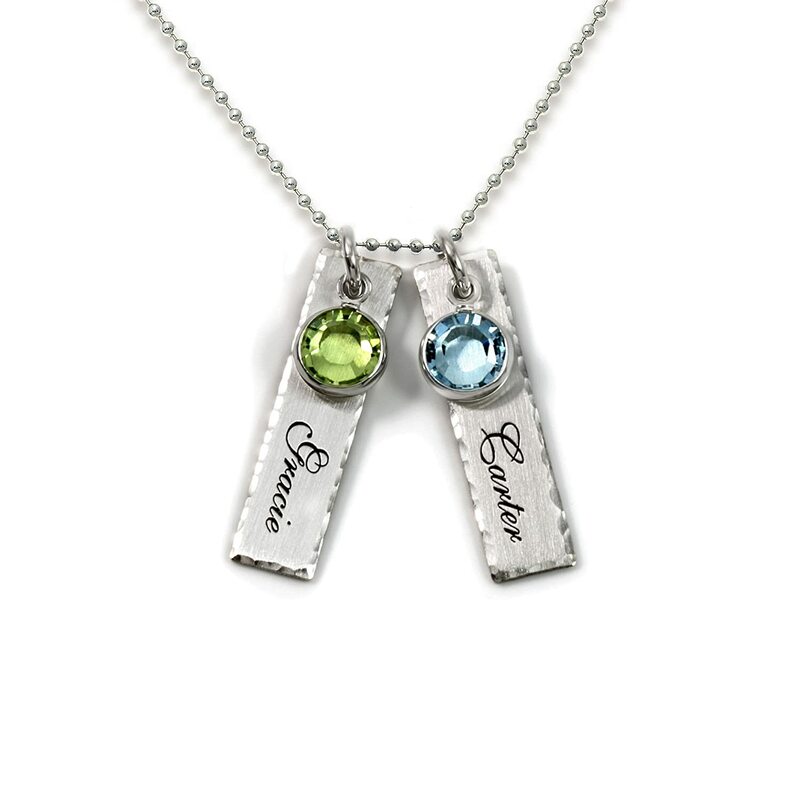 My boys are with me always but now I can display my love for them to others with this beautiful message bar necklace!” – Erin M.
This gorgeous necklace was designed with my baby’s name on it as an early Anniversary gift…I LOVE IT!!! My boys are with me always but now I can display my love for them to others with this beautiful message bar necklace! Isabelle Grace Jewelry has great discounts on their whole personalized jewelry collection, including this beautiful personalized Candy Drop Initial Necklace, it is so fine! A recent review: “I absolutely LOVE this necklace!!!! I was skeptical considering a half hour after I placed my order it had said it had shipped and wasn’t expected for a week but I received it in 2 days!! And it is everything I thought it would be and more… the pictures really don’t do it justice it is way more beautiful in person and I’m getting compliments on it all the time and asked where I got it…. you won’t go wrong by buying it trust me!” – Amanda V.
I review for you a boutique personalized jewelry online store and a cheaper option on Amazon. 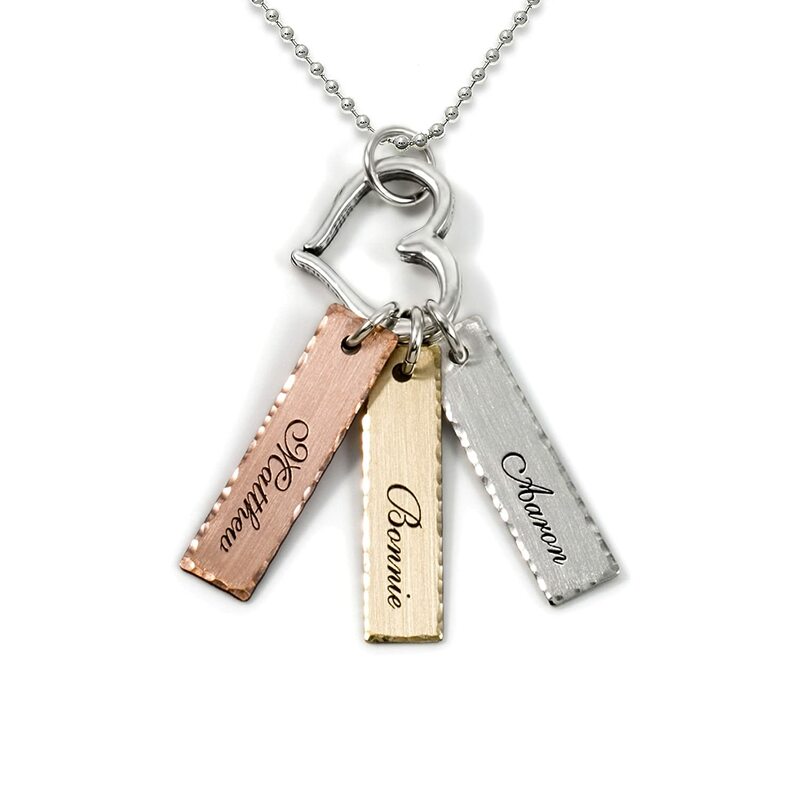 So, literally, the bottom is, YES, Hammered Style Is Perfect for Personalized Jewelry. Beautiful necklace, even better than the pictures online. The disks are concave, which I hadn’t expected, but it looks great that way. Very eye-catching. Couldn’t be happier. And it arrived very quickly and in great condition. Love it! I absolutely LOVE this necklace!!!! I was skeptical considering a half hour after I placed my order it had said it had shipped and wasnt expected for a week but I recieved it in 2 days!! And it is everything I thought it would be and more… the pictures really don’t do it justice it is way more beautiful in person and I’m getting compliments on it all the time and asked where I got it…. you won’t go wrong by buying it trust me! I bought this as a Christmas gift for my mother-in-law and I know she’s going to love it! This is by far my favorite jewelry I own. I’m wearing it constantly besides sleep or showering. I’m very satisfied. Its stunning. I cried when I received it early. I absolutely love my chain and have gotten many compliments on it from day one. It has turned out even better than I imagined. I intend of gifting all of the mommies in my life with one. I know they will love it as much as I do. It’s totally unique, lightweight and stunning. I bought this with my grandaughter’s names. The script is very nice and I haven’t taken it off since I received it. It looks great and i have received many compliments on it. I love this necklace! I’m glad I read the reviews before purchasing since the bars are much smaller than I had originally thought, but knowing that in advance I am 100% satisfied with this purchase. Beautifully crafted and holds a lot of meaning for me with my two sons & fiancés name on them. Necklace came as beautiful and customized as I could have asked for. Had one small issue on the color of the stones but after replying to the email that was sent to me confirming that all was good they have since shipped out a replacement for one of the stones and my wife could not be happier. It really is a beautiful piece. The engraving work was awesome. absolutely LOVE this necklace, its very dainty and light, and love the engraving along with the birthstones, I bought myself this for an early mothers day present and have received lots of compliments, thinking of getting one for my mom, VERY VERY HAPPY WITH THIS PURCHASE!!! This was the best thing ever when I first received it. I gave it to my daughter for mother’s day. After 1 week the chain broke and 2 weeks later the metal is tarnished. She doesnt wear it in the shower, just during the day. The first pic is with original chain. Second pic is with a chain she bought. The necklace is nice but after wearing 2 times the bars started devolving black spots and lines and the metal around the rhinestones scratches the bars so be cautious of this. I contacted the company and they said it’s due to ph levels. I am using the 3 customized tabs for the 3 Schulyer sister costumes I am making for a client. I will be using them for zipper pulls on the back of the bodices and have customized them with the names of the characters. The remaining heart necklace will be given as a gift. 2 uses! Debra H.